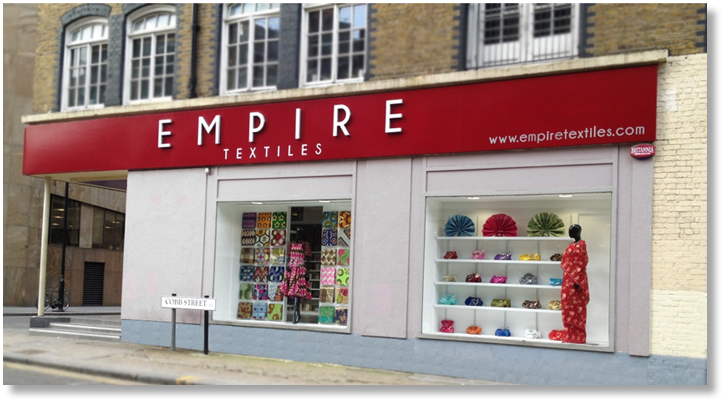 Empire Textiles is the UK's largest dedicated West African textiles store. We provide wholesale West African Fabric. Empire Textiles are West African textiles suppliers based in the UK. With our 6000 square foot store on Middlesex Street, at the heart of London's vibrant West African textiles centre. We have a huge range of West African Swiss Lace, Swiss Voile, Brocade, Wax prints, Georges, Head ties and other fabulous fabrics and welcome hundreds of retail customers, textile retailers and fashion buyers every day. With over 40 years collective experience as a West African textiles retailer in the UK, our team are committed to supplying each customer with the perfect fabrics for their needs at great prices and when required, we can produce most designs displayed on our website as a Uniform for your special occasion. In addition to our extensive range of West African textiles, we also carry a large range of fine Italian matching shoe and bag sets sourced from Italy's most prominent designers. All the West African fabrics and other products here on our site are available to retail customers at the prices indicated, with no minimum purchase. We charge a flat rate delivery cost and ship to addresses worldwide, usually within 3 working days. We supply wholesale West African textiles and other products to trade customers around the world. Please click on the "Wholesale" link at the top of the page for details.